Check Your Thinking: Think about how we impact our precious water – both fresh and salt water – on both the global and local scale. How many ways can you list? The water cycle contains water (H2O) in all its forms (gas, liquid, solid), both available and unavailable to humans. Let’s take one global issue and see how it affects our water: greenhouse gas emissions. Carbon dioxide is the key culprit in the greenhouse dilemma. Aside from affecting global climate change by absorbing heat radiated from the earth, when CO2 dissolves in water, either in solution or in the atmosphere, it forms carbonic acid (HCO3). Carbonic acid results in acidification, or the lowering of pH in our oceans, as well as acidifying natural precipitation, causing acid rain. The slowly increasing acidity in our ocean promotes the dissolution of calcium carbonate, the mineral necessary in the formation and preservation of coral reefs. To marine biologists, coral reefs are known as “the rain forests of the seas” due to the immense biological diversity associated with these reefs. Reefs also function as “home” for approximately 25% of marine species. So how does this phenomenon affect the health of our ecosystems? Drawing upon the principles and content from the water module you completed, here is an example to consider: The Oceans. The oceans cover roughly two-thirds of earth, thus giving rise to the moniker “the blue planet.” Coral reefs are one of densest, most biologically diverse and important ecosystems in the world. What is coral primarily made up of? Calcium Carbonate (CaCO3), or, as it was introduced to you during the water module workshop, limestone. CaCO3 is insoluble in water, but can you recall what happened to its solubility when we acidified the solution with a weak acid (acetic acid or vinegar)? Aside from the devastating effects on coral reefs, increases in ocean temperatures further deteriorate habitat that exclusively occurs in shallow sea areas. It is important to consider the similar risks posed to the health of our coral and other marine ecosystems if our oceans’ acidity and temperature continue to increase. It may seem strange to students living in Montana that heat is a source of pollution for aquatic systems, but one has only to consider how the solubility of oxygen dramatically decreases with increased temperature to understand this impact. 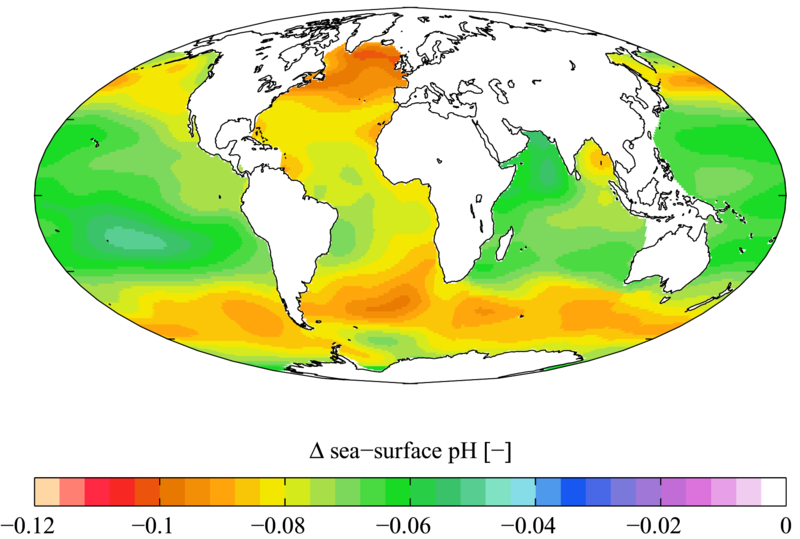 Figure 9.13: Estimated change in sea surface pH caused by anthropogenic CO2 between the 1700′s and the 1990′s. Note that, while the darker orange and red areas above indicate the greatest acidification, the acidity of the vast majority of the Earth’s oceans has increased since the 1700′s. Some of the other human impacts on our oceans and other aquatic systems from a global perspective are mercury contamination, sedimentation, petroleum/organic contamination and plastic contamination (try Googling the Great Pacific Garbage Patch). See if you can explain, on a global scale, how these contaminant phenomena potentially impact human lives and the economies that sustain them. These are big picture considerations of how our industrialized and, more importantly, emerging industrialized nations (e.g. India and China) are poised to tremendously alter, for good or ill, the aquatic and atmospheric health of our planet. Now let’s explore some local ways we impact our water. Consider what most would agree is the least invasive use of water in our homes: turning on the faucet and simply letting it run down the drain. In the beginning of our discussion, we posed the questions: “where does our water come from?” and “where does it go?” We are all connected by water, both upstream and downstream. The water that comes out our faucets comes from one source and usually ends up in another. This physical movement of water is an impact or change in the body of water or aquifer from which it came, even if the water is untreated (i.e. chlorinated, filtered, softened). When the water goes down our drains, it either ends up in a septic system, where it mixes with water that is more heavily impacted, or it is piped to a wastewater treatment plant, where its fate is similar, only on a much larger scale. How does this journey from faucet to drain affect the water quality? Bacteria and nutrients from livestock, pet wastes and faulty septic systems. Compare a more urbanized landscape with developed areas and paved streets to a rural space where dirt roads are the route of transportation and homes and buildings are sparse. How are they different in terms of the quantity of non-point source pollution? (Hint: Think about the difference in the amount of water that runs off, or evaporates from, pervious or porous areas compared to the amount that flows from impervious or paved areas.) What about the quality? Using the bulleted list of non-point sources of pollution and some of the point source examples, try to find examples of each in your school or community and predict some of the changes or impacts they might have on water on your local level. These exercises of thinking globally and locally in terms of water will give you all the skills of observation and understanding necessary to choose and develop a project to study the water quality impacts in your study site, school, town or watershed. Visit the Forum: Impacts on Water Quality to discuss the examples listed above, as well as potential local water quality issues or potential study projects, or leave a comment below to get feedback from the MSP team.